History is a construct, a matter of perception; it's also personal and fixed firmly in our particular present. And, according to most of the reviews which I've read, the same seems to apply to people's perceptions of the merits and faults of this book. As a historian presently exploring my own approach, I have to confess, I am rather drawn to this kind of academic navel gazing. Hence I've no doubt I shall at some point return to The Landscape of History for a repeat reading. Make no mistake. This is a heavy-weight set of meditations on historiography. Thoughtful and thought-provoking, but in parts it is highly dense and heavy going. Some years ago now I did my first degree in a distinctly Marxist Anthropology Dept., and so I was surprised (and somewhat startled!) to find I could follow and found the chapters on Marx particularly illuminating. Likewise, I found the later chapters on the 'Annales', History from Below, counterfactuals, and, post-modernism/identity history all made very fruitful reading. 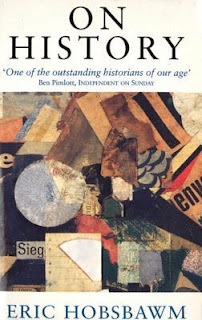 Hobsbawm is widely regarded as a formidable historian, and, as a first taster, in reading this book I can well see why! Onwards to his The Age of Empire, 1875-1914 and his Nations and Nationalism since 1780 ... I may be some time. 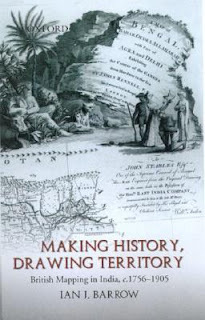 This book describes itself as: "A unique study of British possession and territorial legitimacy in India as represented by colonial maps, this book focuses on various strategies used by map-makers and surveyors to embed a past into their narratives, and concludes that maps were used both to demonstrate a history of territory and, importantly, to justify the possession of land in colonial times in the Indian subcontinent." An interesting and curious read. Making History, Drawing Territory covers a remarkable amount of ground (excuse the pun) for such a slim book, yet tends to spend more time saying what it's going to say rather than actually saying it! 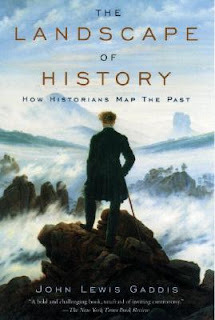 The author does seem very aware that he is writing in the shadow of several rather more substantial works in this field, most notably Matthew Edney's excellent Mapping an Empire (University of Chicago Press, 1999), yet most interestingly Barrow strives to shift the hitherto predominant focus of academic enquiry in this field away from the purely scientific to consider the more social aspects of analysis and interpretation, and thus opens up a number of intriguing questions which perhaps a longer and more in-depth examination might have made for a more rounded and satisfying work - instead it reads rather like a set of five loosely connected essays introducing similar themes, in this sense it's an excellent 'primer' text. A worthwhile and engaging read nonetheless. Incorporating a rich array of primary and secondary sources, as well as fold-out reproductions of many maps, I would certainly very much recommend this book to anyone interested in the history of cartography, British imperialism, and the trigonometrical survey of India.